"The Simply Great Coffee branding has a coffeehouse feel that is very impactful. It’s resonating well with our customers and we’re going to roll it out to even more stores." 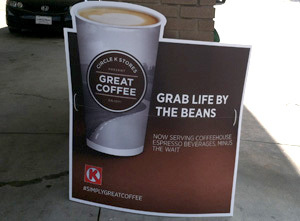 Circle K challenged GSP to create a new look for their new coffee offering and also create excitement at the store level. The design of the POP would influence the in-store coffee experience and marketing as well as create direction for future rollout. The idea was intended to attract a new customer segment, the millennial audience, while still making traditional coffee customers feel comfortable. GSP’s Design Services team created a campaign to tell the story of "Simply Great Coffee" that features the new European white espresso-based coffee. 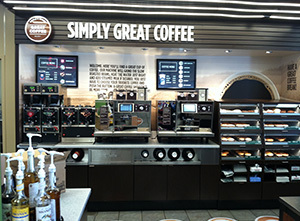 The campaign, which was first rolled out in Charlotte, NC, at select stores based on local demographics, focused on the “Great Coffee Experience.” GSP helped to translate the messaging into a system of POP that would work to communicate the new expanded, upscale product mix. 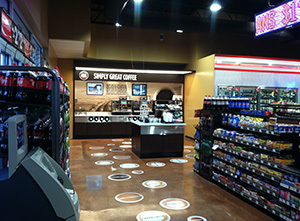 GSP also rebranded the coffee area to highlight the new coffee equipment and convey an elevated coffee bar experience. The Simply Great Coffee campaign and new rebranded coffee program has successfully helped to capture the attention of the millenials. The stores are seeing higher traffic and increased coffee revenues. 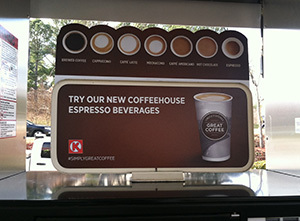 The new program, after being well received in the Charlotte test market, has also been rolled out in the Circle K Florida and Circle K Southwest regions in select stores, and the company plans to roll out to all regions in the coming year.